Flying in by helicopter is the only way to reach Minaret Station, unless you are a sheep maybe. This wonderfully isolated spot sits in an alpine valley high above Lake Wanaka, in the south of the South Island. It is pure wilderness. Purpose-built and family-owned, Minaret Station is part of a large high country farm that drops from the skyline to the lake edge. It is big country where you can hike, fish, ski, mountain bike and hunt - all accessed by helicopter. Or just sit on the verandah of your chalet and watch the sun pass over the mountains around you. Accommodation is in free-standing luxury chalets, all comfortably appointed with NZ wool rugs on the floor and possum throws on the beds. Each chalet has a large dressing room, private verandah with hot tub, a warm seating area and sensational views. Sit around the fireplace in the main lodge and mingle with other guests. Also in the main lodge, the cuisine served in the Mountain Kitchen is fresh, local and delicious. The chef offers fantastic local ingredients in a fusion style and the wine list is extensive. We can also arrange a day trip, where you fly in from Queenstown or Wanaka, enjoy a 5-star lunch, hike the walking trails nearby and enjoy the splendid isolation. 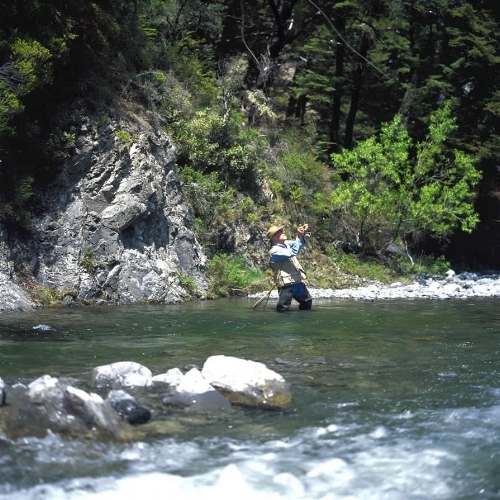 If you are keen to learn more about Minaret Station as a fly fishing lodge then head over to our dedicated New Zealand Fishing Lodges website, or email us for more details.